So, everyone always asks me if I have children and I do! I have two step-sons and two step-grandsons and I never use the word step, hate that! I love them as if they were my own and even though my husband is quite a bit older than me, I know his offspring will always be a part of my life! I'm not sure why Badger is Cajun, but he does like swampy things, bugs, frongs, you name it, he's on it. I don't just mean casual bug drive by chasings, I mean intense focus until that sucker is found. Badger is our tuff guy, he sports a natureal mohawk, looks like a combination of a reverse skunk in color and a honey badger, hence the name) . He has fierce talons not to be reckoned with , even by his Russion groomer who says she will use the "muscle" if necessary on him....I think that is her version of muzzle. She keeps him honest I know that much. He dances with me and has a collection of toys in the backyard you wouldn't believe. He has hiding spots too....he's a bit sneaky. He'll be running with a toy and be looking at you as he runs away instead of where he's going like he's just made a big heist! Badger was adopted at the Pasadena Animal Control and Adoption after he reached out his paw and placed it gently on my husband's foot. He was days away from being put to sleep..don't think the under-bite and the mohawk were as attractive to others as they were to us....don't know why! Well, here's the smallest of the group, but definitely the alpha. 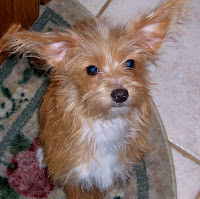 Part Yorkie and part Chihuahua, they call her a "Chorkie". 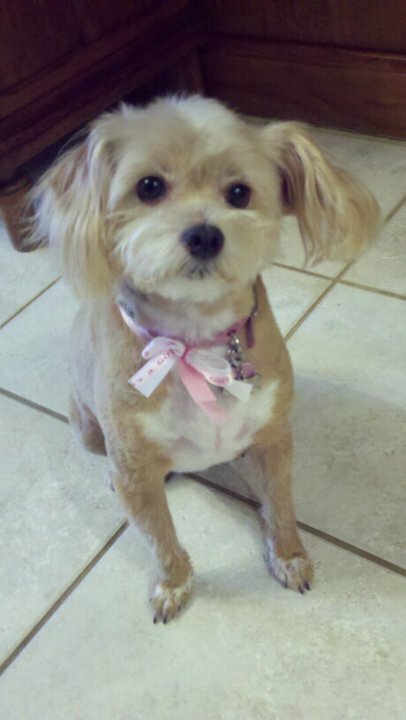 I call her my "Pwetty Pwincess"!! We have never shown her a mirror so she has no idea she weighs in under 10 lbs. 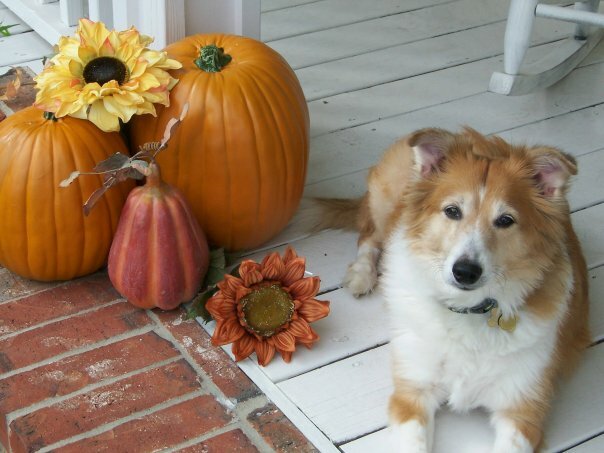 She's a special one because we went to the Pasadena Animal Control and Adoption for a therapy visit after fostering a beautiful sheltie mix named Truman for two years that passed away and Trixie was there. She actually picked me out from an obscure room that wasn't even processed for viewing yet. Someone had turned her in from a puppy mill (designer breeder) with a broken leg I'm assuming because the couldn't sell her....bad for them....GREAT for me. What a blessing! I couldn't put her down and didn't....seriously, I never do anything like this, but I told the staff I couldn't leave without her and we finally worked it out. She's been my sassy little bud and studio assistant ever since. She's is one tough chica behind that cute exterior! This is Benny, a/k/a Benny McBeenerton, he's part chihuahua, part dachshund and all boy...except he likes to play with Trixie's pink toys....we don't judge him. He came to us about a year ago after sharing the wonderful last years of my husband's mother's life with her. We are convinced this little guy helped his "Granny" live longer and happier so we're happy to have him on board. He LOVES to take rides in the car and has very good car manners. 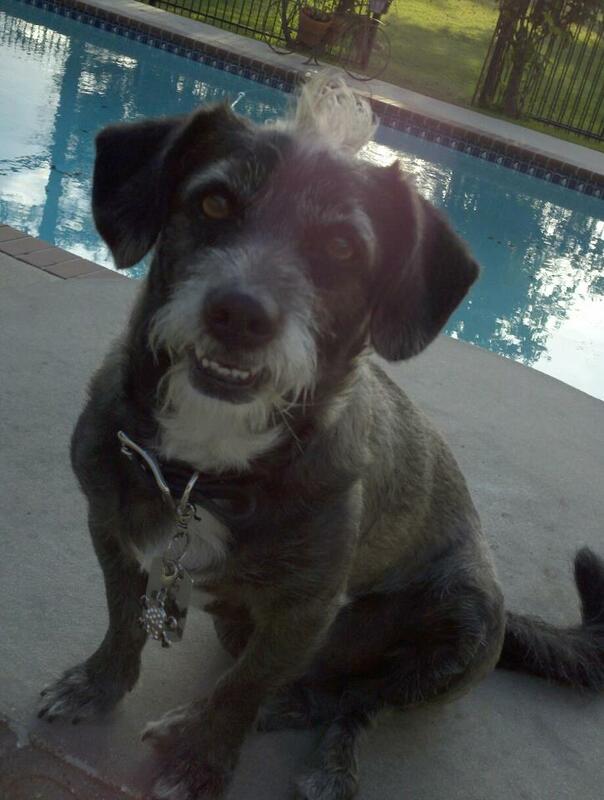 Badger was adopted at the Pasadena Animal Control and Adoption by my husband's mother after, get this, being returned by 3 other families....God knew his purpose and now he's retired and loving it! Sugar was also adopted to protect us outside and she does just that. She was turned in by someone in a farm area where she hung with her best friend, a horse. They were scared because they knew the dog had been run over and shot at out there and were afraid she might get killed. She is part Chow part Sheppard and as sweet as molasses unless you're messing with her territory, then her gator mouth jaw will scare the begeebeez out of anyone! She loves to swim and is very shy unless you know her. In fact, it was hard to take her picture, she's scared of just about everything until there is a true threat, then she does her job! She's been through two diseases that almost killed her too so she's a real survivor. 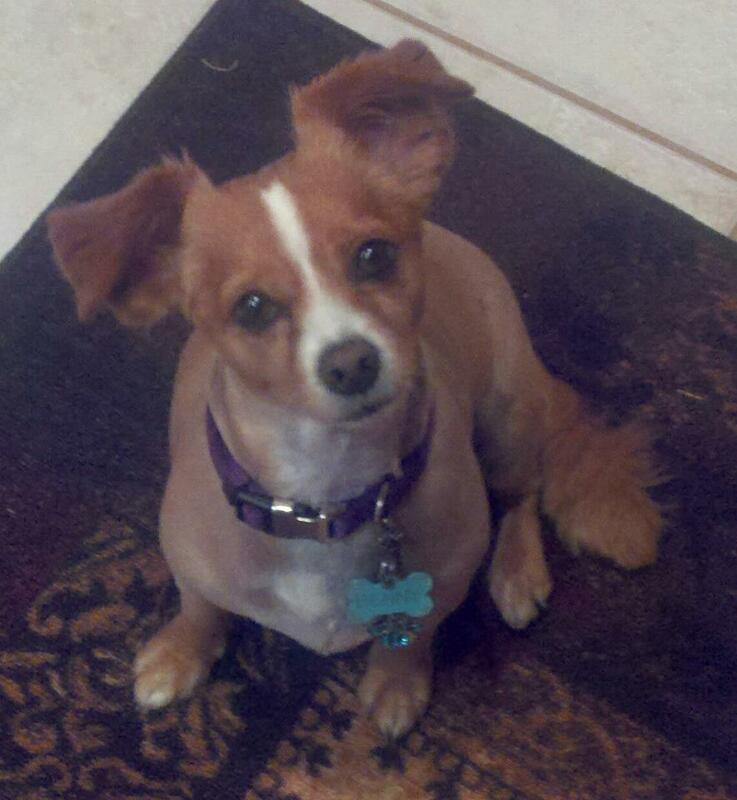 All that drama is over for her, she is happy and healthy and hit the dog lotto at the Anderson house! So, that's the FAM....how did we end up with so many? Rescues, suckers, call it what you will. Someday when we retire, we hope to rescue more of these sweet babies that steal our hearts! I will say there was one special pup who started it all .....our angel pup, Munch, may he rest in peace, was our only child for so so many years. He was happier and smarter than any dog and did so so many tricks. We fell in love with dogs because of this guy so I must give him credit. More people came to his funeral than actual people I've seen at some, so I know he fulfilled his Godly purpose in our lives! HERE'S TO YOU MUNCHIE....WE LOVE YOU FOREVER AND MISS YOU TERRIBLY! The third delivery I was so blessed to receive was this amazing new line of Multi-Surface Paints and other Mod Podge tools and accessories from my friend Chris at PLAID Enterprises! So, here's my spoiled rotten Plaid kid package and my ever-so-nice busy buzzy bee note from Chris!! Look at all those yummy new colors that are crazy good for all surfaces. The texture of it is so smooth, no smell and beautiful rich colors. I really can't wait to give them a whirl!! On top of the over-the-top selection of paints, Chris spoiled me with Mod Podge coolness!! 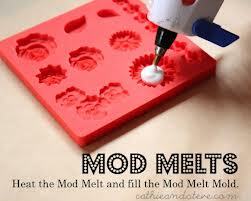 I am loving these Mod Podge Melts that Cathie Fillian and Steve Piacenza designed! 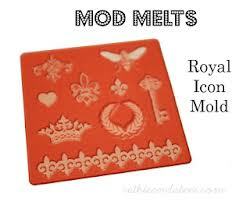 Here's a video regarding the Mod Podge Melts line!! So that's my week in deliveries! Feeling so blessed right now and overwhelmed with great ideas for all of these new goodies!! Should be posting results soon! "ThE CaNdY MaN" (a/k/a delivery dude) is my bff this week! A huge thank you to Rebecca with THE RIT STUDIO for this lovely little care package of creativity and to Laura Kelley for arranging the delivery! I'm "dye-ing" to see what happens with this box o' fun! Look out! The delivery man, or as I like to call him "ThE CaNdY MaN" has been at it again! First, thanks to Laura Kelley for the blog hop invite! So so cute!! Wondering what to create! For those of you who don't know Laura, she is the creator of My Peeps, those adorbs little characters you see on the back of everyone's cars depicting their fams! Here's a link to Laura Kelley's blog.